I was quite happy to discover Despicable Me to be one of those shining exceptions. Gru is a villain. He's not exactly evil, he's more a villain who has a lot of personal drive coupled with some mommy issues and unfortunately not all his evil deeds have turned out well. But that doesn't stop Gru. He's happily planning his next big villainous act, which will also prove to mom he's worth his salt, when an upstart youngling of a villain, Vector, swoops in on the scene. 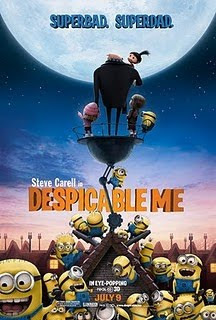 Gru is driven to drastic measures to complete his scheme and becomes the psuedo-father to three orphan sisters. And you know how it is, (and without any spoilers) once kids are involved that changes everything. Despicable Me was charming. It was unpredictable. And it was funny, in that rare territory that balanced smart humor with slapstick, that neither fell too much into childish crassness nor was so adult sly it was over the heads of kids. Whereas Toy Story 3 (as I'm sure you heard by now) was a non-stop thrill-ride with a tearjerker end, Despicable Me was this summer's uplifting, sweet counterpart. I thoroughly enjoyed it and my five-year-old son came out of the movie brimming with praise (you know, for a five-year-old). And for once, I felt the 3-D actually enhanced the movie. I would say Despicable Me absolutely merits a trip to the theaters this summer and even donning those tacky glasses. Even though Hollywood is otherwise training me to be abusive to animals should they ever start talking one day.